This traditional cider vinegar is made from freshly pressed apple juice that is allowed to ferment over a four- to six-week period at room temperature. Strongly acidic, quality cider vinegar has a bright, crisp flavor and tastes like the apples from which it was pressed. Apple-cider vinegar is used in dressings, sauces, condiments, marinades, and pickles. Originally produced only in Modena, Italy, balsamic vinegar is now made in many places, chiefly in California. The best balsamic vinegar is made only from Trebbiano grapes. With a taste blending both sweet and sour, it has a dark color and is one of the most flavorful of vinegars. It can be sprinkled on cooked meats, salad greens, strawberries, peaches, and melons. There is also a white balsamic vinegar (a pale gold), which has a sharper twist to it than most darker balsamic varieties. Made of sprouted and fermented barley, malt vinegar is too strongly flavored for salad dressings. However, when it is distilled to a clear white, instead of amber brown, it is excellent for pickling, and in England it is liberally splashed over fish and chips. This vinegar, distilled from rice, has less of a sharp tang than cider vinegar, and just a hint of sweetness. The Japanese use it in making rice for sushi, in dipping sauces, and to create many pickled dishes. It is also good for marinating tofu (with soy sauce and ginger), and in grain and bean salads. Widely used in Asian dishes, rice vinegar is popular because it does not significantly alter the appearance of the food. Umeboshi vinegar is a pink brine with a deep cherry aroma and a fruity, sour flavor. It is a by-product produced when umeboshi (Japanese pickled plums) is made. Technically, it is not classified as a vinegar because it contains salt, but it is a good substitute for vinegar and salt in any recipe. It has a light, citric flavor and lends itself well to salad dressings and adding flavor to steamed vegetables. This vinegar is strong, acidic, and too sharp for dressings and regular cooking. Use it sparingly, or substitute lemon, tomato, or grapefruit juice in recipes where white vinegar is called for. Wine vinegar—made from red, white, or rose wines—is an excellent condiment. These vinegars may be used interchangeably. They are flavorful, fruity, and combine well with salads, sauces, and dressings. 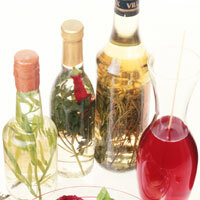 Sometimes wine vinegars have fruit or herbs, such as raspberry or tarragon, added to them. Raspberry vinegar can be sprinkled on fruit salads, used as a marinade or basting sauce for meats, added to your favorite salad dressing, or used by itself on salads or cooked vegetables. Herb vinegars are especially useful in salads and savory dishes. In the Philippines and Indonesia, coconut and cane vinegars are popular, and in the Middle East, date vinegar is a favorite.